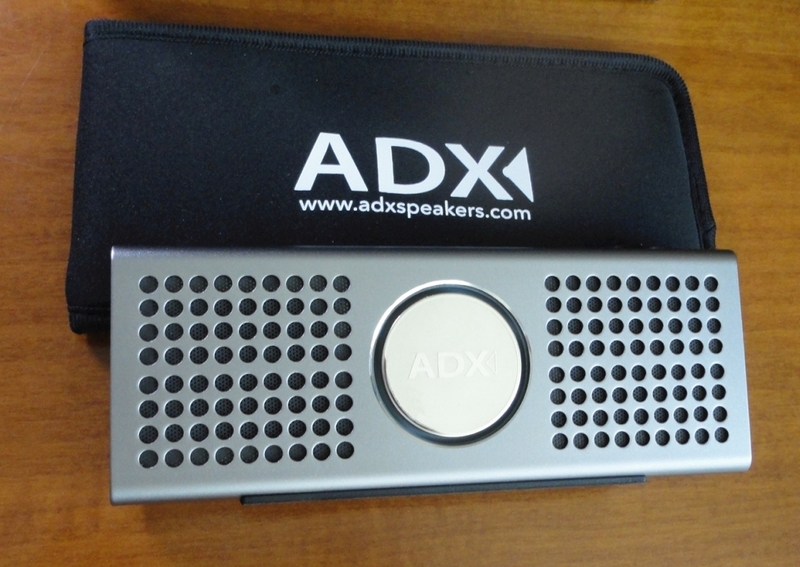 The ADX Pulse V3 speaker was provided to me for review purposes. It arrived over two months ago and it has been in daily use ever since. It is, without any doubt, the BEST portable speaker I have experienced (so far). I know I said that about the Fusion V3, but then I had not met the Pulse. The Pulse V3 features the same impeccable build quality as the Fusion - which I still love and continue to use in a different room. For technical details and specs, there is a full description on the Amazon page, no need to repeat all that here. An interesting point: this speaker's performance improves over time and a breaking-in period of 50 hours should be expected. The packaging is excellent. 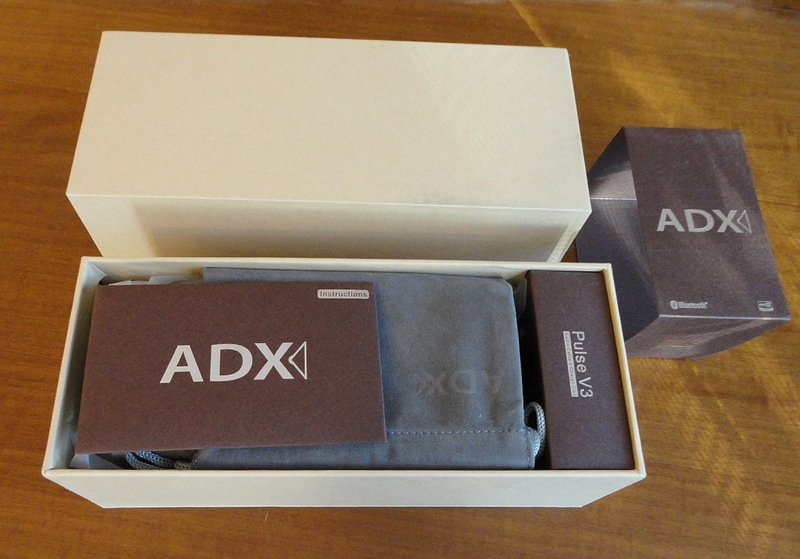 The Pulse comes in a beautiful box, carefully arranged for stability and protection. 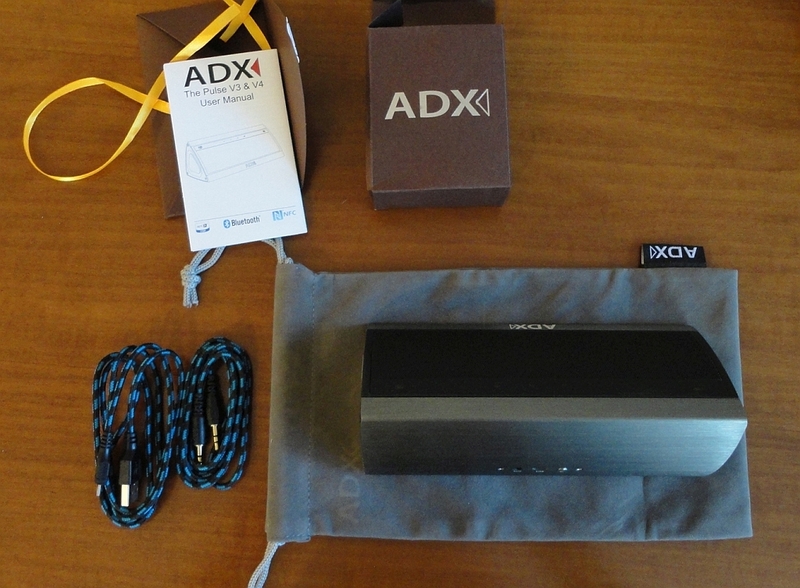 You lift it out by pulling on a satin ribbon, and the top-quality braided cables are stored in a separate box: a USB micro cable for recharging and an gold-tipped auxiliary 3.5 mm to extend the Pulse's connectivity to non-Bluetooth equipment. 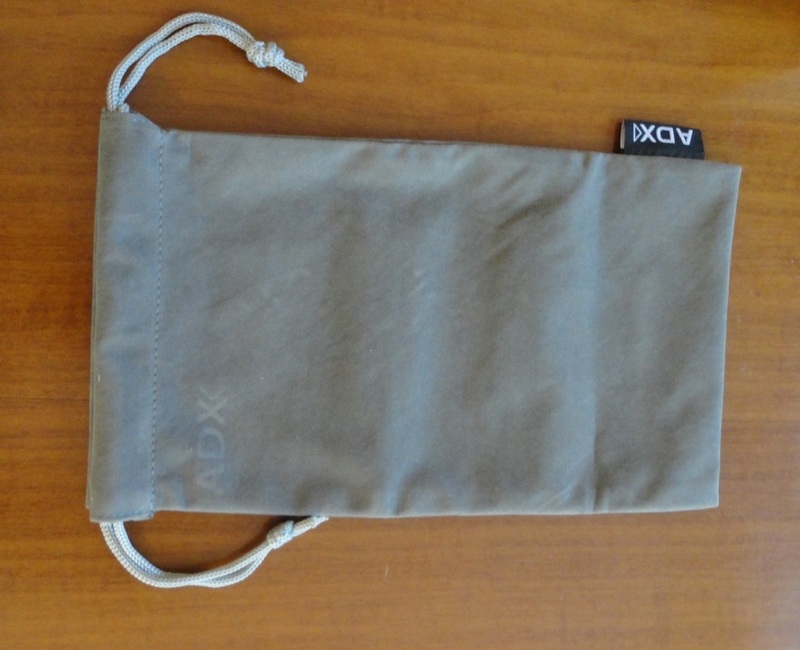 The storage bag is gorgeous as well, a soft velveteen with a drawstring closure. 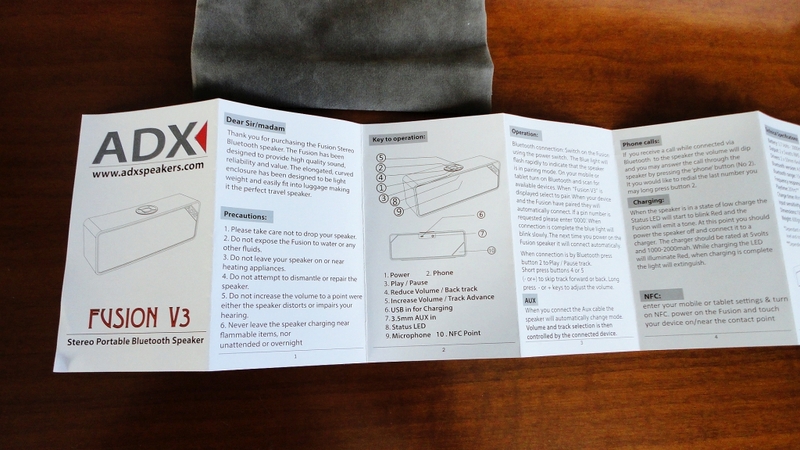 A clear manual completes a package that, given as a gift, would impress and delight most people I know. For me, the most unique thing about this speaker is the separation of sound, the layering and complexity that seem unlikely when first viewing the physical body. I think it has a lot to do with the shape - pyramidal shapes have always intrigued me - and the way sound comes out of the sloping front. There is a good reason for the 3D button on the control bar ... it really is like listening to sound in 3D. Playing classical music, I can hear distinctly all the different instruments as if I were in front of a live orchestra. The volume is surprising and more than adequate for my needs, and for resonance, it actually beats the output of my two wired-in speakers plus subwoofer. Placing the Pulse in a corner near the walls can boost the bass even further, but for me, I've got all the solid, rocking bass I need, with it just sitting here on my desk. The other outstanding feature is the ease of Bluetooth “bonding” with my laptop. Once the initial pairing was done, it seemed to lock on and now all I need to do is hit the ON button and it's there (by the way, a double press turns it off). With other speakers, there is an awkward wait, much flashing and finally the connection is re-established. In fact, it even defeats my laptop's well known propensity to revert to the onboard speakers. It works equally well when I take the Pulse into another room, across a solid stone wall, which is always the final test I put my Bluetooth speakers through. The Pulse V3 has the most solid long-range connection I have seen so far and it's rated 20 metres, which is close to double the usual range. Battery life is incredible. I haven't measured it exactly but the quoted 16 hours are easily achieved. 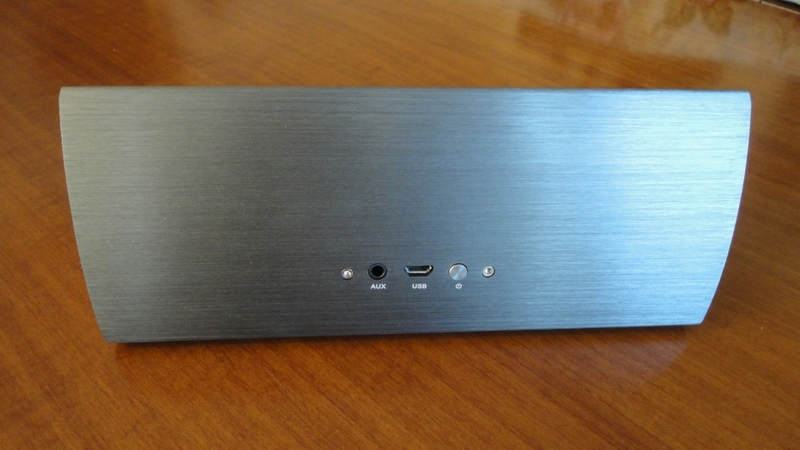 The single On/Off button is at the back, next to the two ports, making for a remarkably clean interface. The backlit LED command strip is different from the more commons buttons, but I found it easy to use and understand. So, as someone who cares mostly about the sound, I think this is a fabulous, very portable, superb-looking Bluetooth speaker, which has become my new favourite. 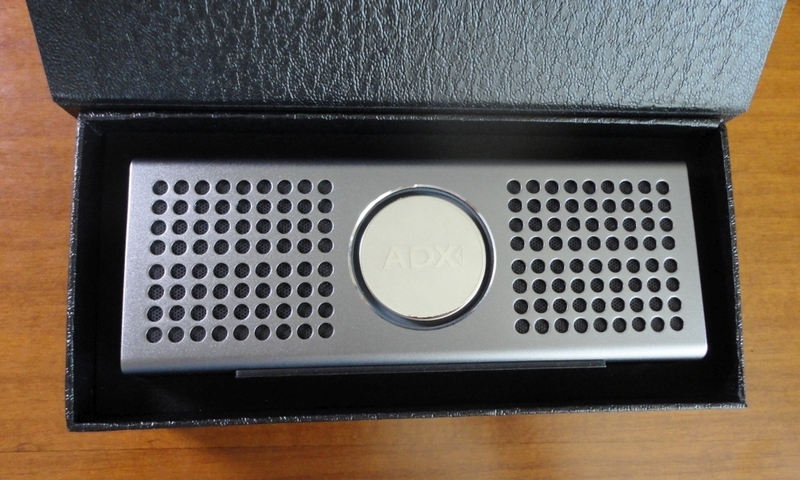 A beautiful, sleek look for this really excellent Bluetooth speaker, sent to me for evaluation by the vendor. I have the Metallic Black which is really a light charcoal grey, very edgy. With a chance to try out quite a few Bluetooth speakers over the last year or so, I am constantly amazed at the new technological advances in this very competitive field. This speaker is easily at the top of the class, employing state-of-the-art technology and clearly beautifully engineered but, from a purely audiophile viewpoint, it really impressed me with its clear sound reproduction with an impeccable balance between treble and bass. Included in the package are a USB cable for battery recharging, an auxiliary 3.5 mm cable for connection to non-Bluetooth devices, a lovely storage bag and a very clear and well-organized manual in English. The speaker is remarkably thin but stands very solidly on a rubberised base that runs almost the whole length of the body. 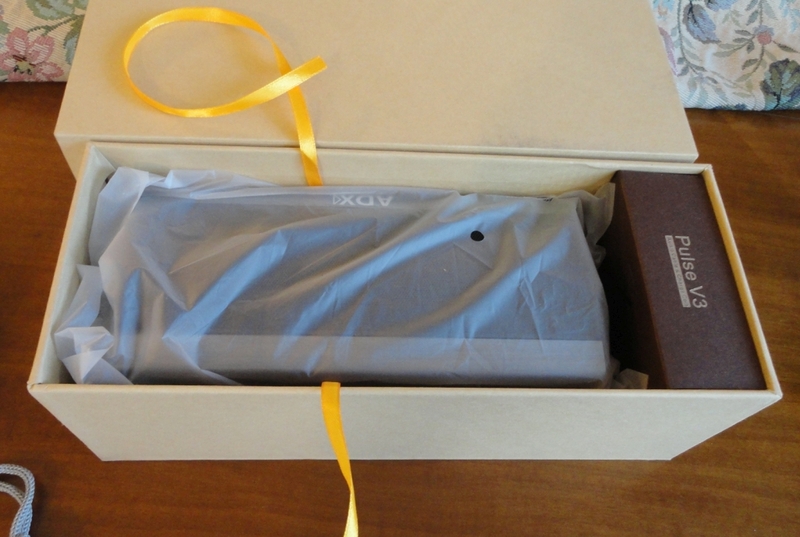 The box itself is gorgeous, with a magnetic fold-down flap. It would make an impressive gift. At the top are four large, rubberised, protruding buttons. It's very easy to memorize what they do just by feeling them without any need to look: a flat ON/OFF button, Previous Track / Volume Down, Next Track / Volume Up and Play/Pause. On the right side panel are the input ports for micro USB charging cable, Auxiliary audio cable and a very useful extra slot for an SD memory card, making this small powerhouse a really portable music source. I find the sound incredible. You can crank it up in volume and it stays clean and pure, and free from distortion even at louder levels. 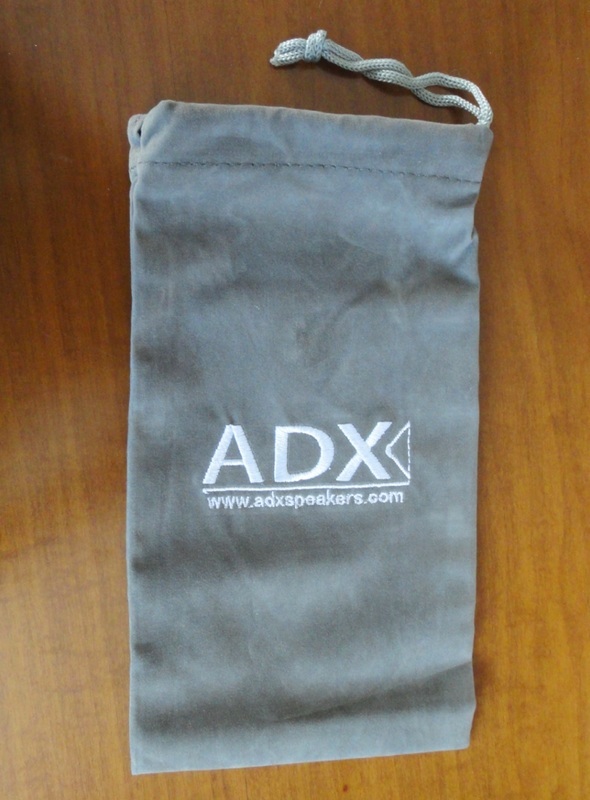 When the bass is really pumping, the large round ADX circles, back and front, vibrate in a fascinating way. Connectivity was easy and immediate. I liked the unambiguous identification as Clarity (which makes a refreshing change from having to remember some arcane alpha-numerical code name). We tested it with a laptop running Windows 8.1, my Kindle Fire HD and a friend's iPad. It should be compatible with practically anything with Bluetooth capabilities, and the auxiliary audio cable will make it work with any device with a 3.5 mm input jack. Operating range is an impressive 20 metres, although the signal tended to break up through my house's thick stone walls. The advertised battery life of 10 hours is quite accurate. Apart from its beautiful brushed aluminium skin, fantastic performance and ease of use, the other surprising thing is the price, which is more than competitive. Top performance, moderate price, it represents excellent value because the quality is certainly high-end. 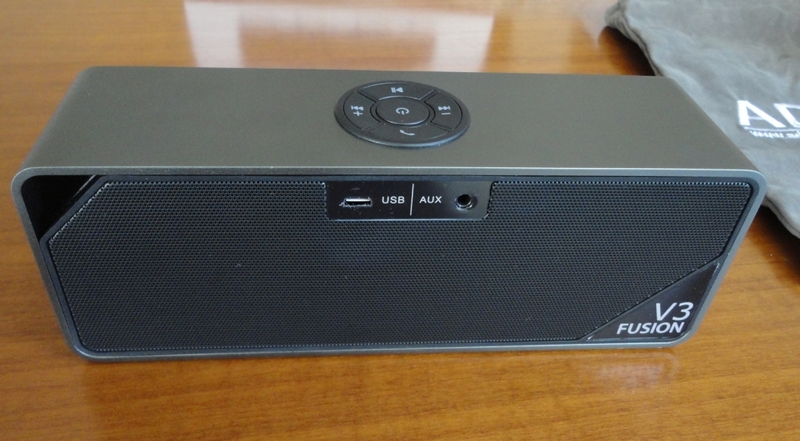 Without a doubt, the best Bluetooth speaker to have come my way, ever. 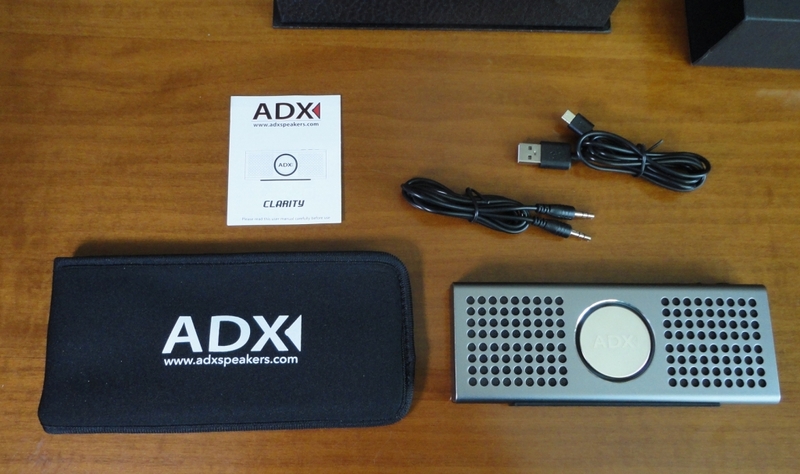 I was very impressed by the Clarity (the other Audio Dynamix speaker I was sent to test and review), and did not believe its quality could be bettered, but I stand corrected. The Fusion V3 matches all the great characteristics of the Clarity but is actually more powerful, more imposing and generally more muscled-up. I'm pretty sure they are not meant to be compared, as they address different requirements and the Clarity was obviously built with extreme portability in mind. 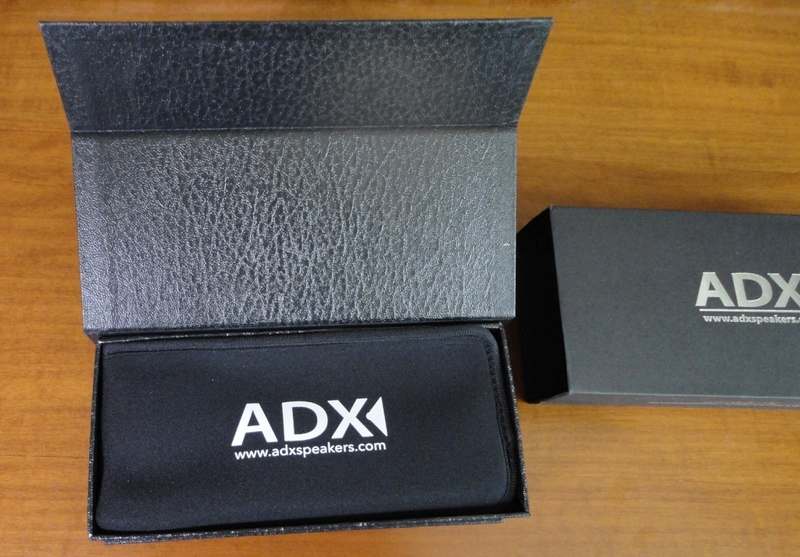 The look is typical ADX, sleek, stylish and the opposite of gimmicky. It is available in three soberly attractive finishes: Iron Grey, Coffee and Silver. They are all superb and designed to blend in with any décor, exuding an elegant air of solid confidence. The packaging is good enough for gift giving. Included are a USB cable to recharge the battery, an auxiliary 3.5 mm cable, a beautiful storage bag and a perfectly understandable manual in correct English. The squared off shape sits solidly on a large anti-slip base which cushions the speaker and will not harm even the most fragile finish. The commands are grouped within a round shape at the top of the speaker and are conveniently in line with current standards, so you don't have to spend a lot of time studying the manual and getting used to a new way of doing things. There is a central On/Off button which also initiates pairing with Bluetooth-enabled devices; two multi-function lateral buttons for Volume Up/Volume Down and Next Track/Previous Track; a telephone answering button; and a Play/Pause button in front. All these functions are available in Bluetooth mode. When the auxiliary audio cable is used, volume and track skipping are controlled from the playing device. 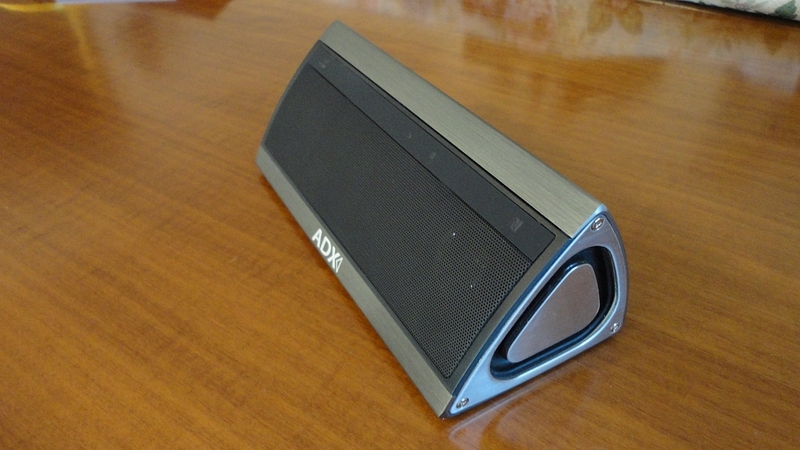 This speaker also offers NFC connectivity with compatible phones and tablets. I was not able to test this, so cannot comment on this aspect. 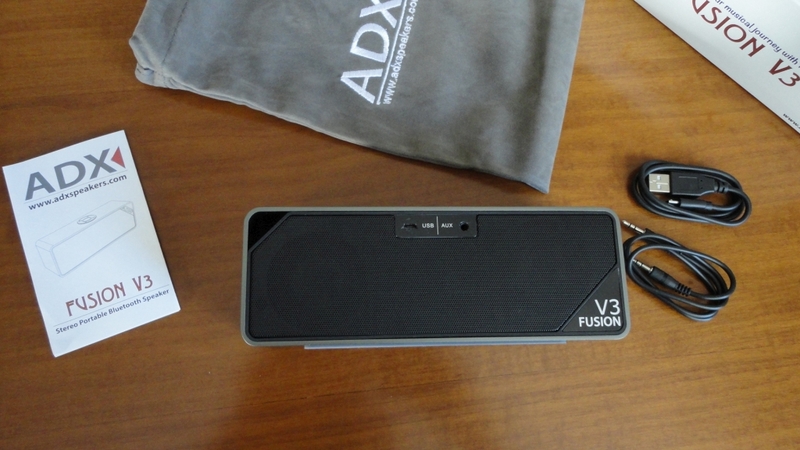 I have had it now for two months and during this time the Fusion V3 has worked flawlessly both in Bluetooth mode and plugged in with the supplied auxiliary audio cable, an option not always present in competing products. With the direct audio connection, the Fusion in not restricted to Bluetooth-enabled equipment but can be used with any device with a standard 3.5 mm input jack, making it universally compatible with equipment of different ages. Oh, and the battery lasts for ages. And coming to the crux, I find the sound absolutely amazing. For me, it is the perfect balance of the whole spectrum and the separation of high, mid and low tones is very satisfactory. 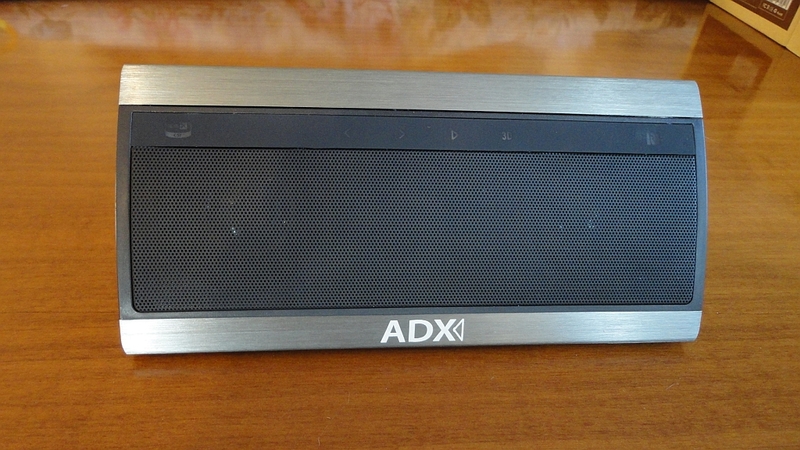 This speaker can produce remarkably loud sound without distortion or degradation. My favourite music is rendered with all the power and depth I enjoy. 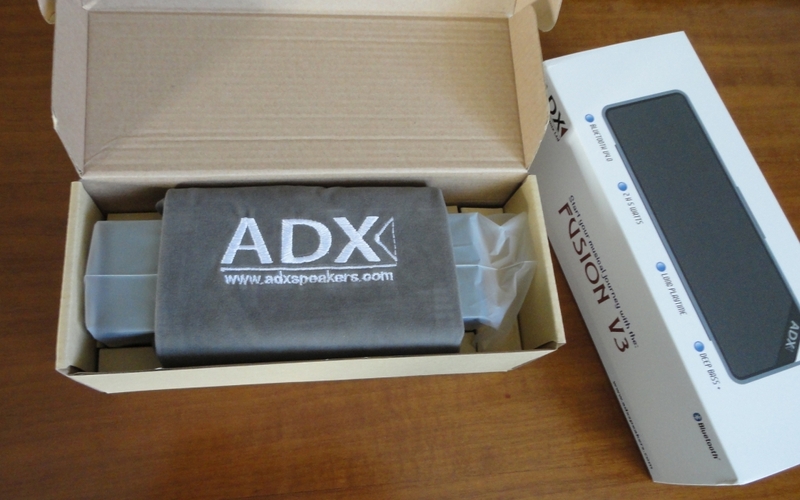 The Fusion V3 is the only speaker I need for my computing purposes, easily surpassing the performance of my current plugged-in speakers, and my husband even uses it as his sounding board for music production, when he needs to hear how the music he makes is rendered in different environments. The fact that it's portable is bonus. I can't quite believe the low price because I have tested many other Bluetooth speakers in the same price range which simply cannot compare. I have no hesitation in recommending this model to anyone looking for a Bluetooth speaker with superior performance and impeccable quality build.